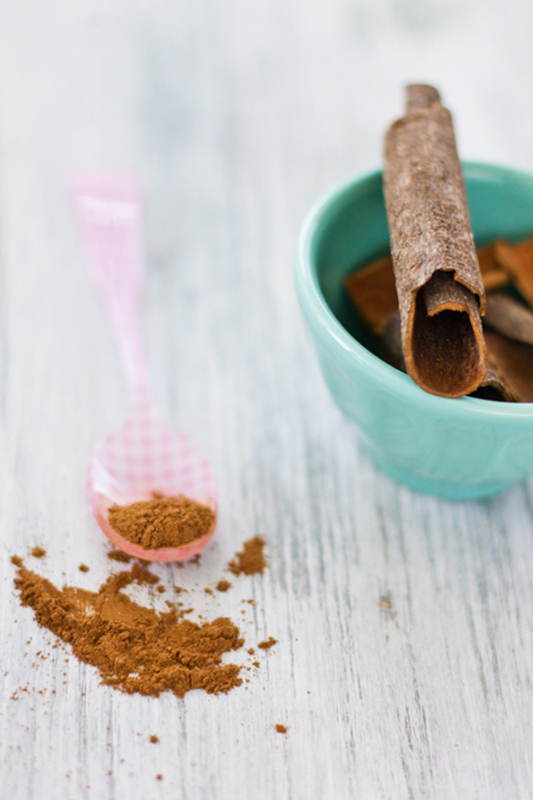 Sometimes, all it takes is a packet of woody, fragrant and curled cinnamon sticks to inspire me, brighten my day and warm our home. I bought a bag of these fresh curly spices and whilst unpacking the groceries, I knew I had to incorporate them into our day. My parents were in town last week to visit a new addition to our family. Nope, not me......my sister. She gave birth to a beautiful baby girl called Fatema just over two weeks ago, hence the lack of blogging. Who knew a wee baby could take up so much time and attention. Maryam is besotted with the new 'doll' and we constantly make visits to my sister's apartment. Good thing she lives in the same building as me. Besides spending time with my family, I have been busy developing recipes, cooking and shooting for various magazines, both locally and online. I can't wait to share these with you. Stay tuned in the next few blog posts. But just because I didn't get a chance to blog doesn't mean we haven't been eating fresh, homemade , wholesome food- my mum's favorite apple crumble, cinnamon and cardamom spiced shawarmas that my dad requested, green moong bean soup, cumin scented pilaf. There's just something else about spending time with my Mom in the kitchen- food is more flavorsome with plenty of laughter, stories and tips shared around our dinner table. 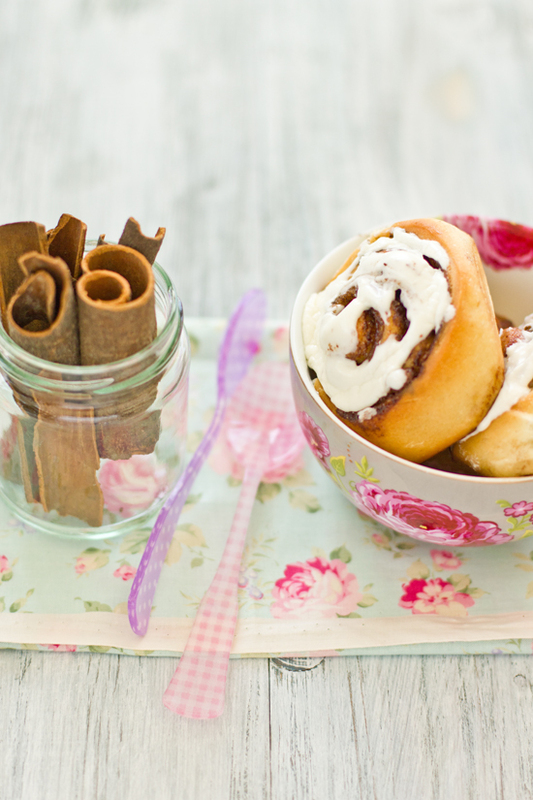 And then there were these cinnamon rolls. 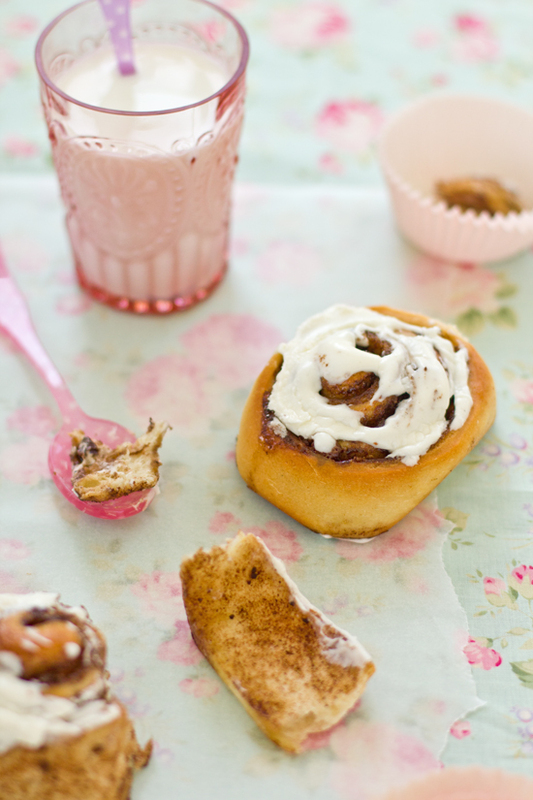 Pillowy swirls encased with freshly ground woody cinnamon, butter and brown sugar. Oh, and some chocolate chips for good measure. They were perfect with afternoon tea at the park. October also marks one year since this blog has been running. I do have a special post planned with a giveaway that I'm sure you'll love. 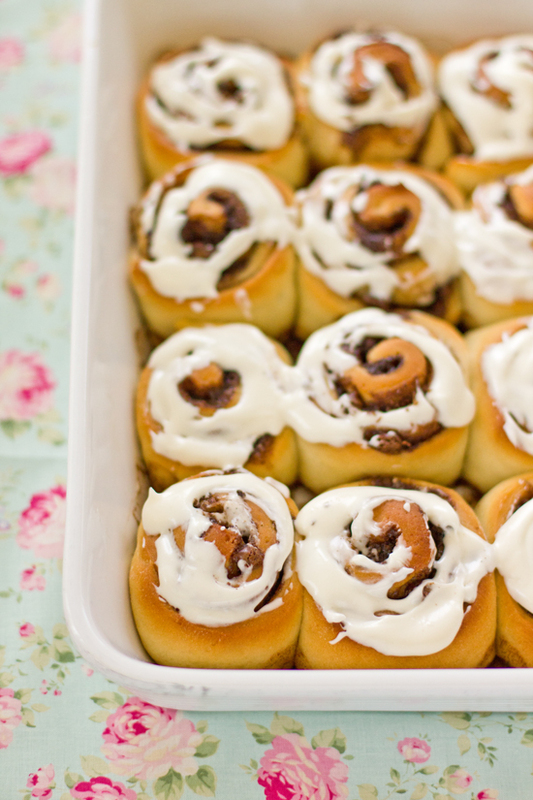 In the mean time, I hope you enjoy these cinnamon rolls. Me and Maryam certainly did. In a small bowl, combine the milk, eggs and melted margarine. In a separate bowl, mix together the flour, salt, sugar and yeast. Make a well in the centre and add the wet ingredients. Knead the dough till it is soft and pillowy. I found the dough to be too sticky and added a further 1/4 cup flour. Cover the dough with a cloth for an hour or until it has doubled in size. When double in size, turn the dough out onto a lightly floured surface and roll into two 16 by 21 inch rectangles. Combine together the brown sugar, butter and cinnamon. Spread this paste over the rectangles and sprinkle with chocolate chips. Roll the dough into a swiss roll and cut into 12 rolls each. Place the rolls into a lightly greased baking tray. Cover with a cloth and let it rise for 30 minutes or until double in size again. Preheat the oven to 180 degrees Centigrade in the meantime. Bake rolls in the oven until golden, approximately 20 minutes. While the rolls are baking, make the cream cheese frosting by beating together the rest of the ingredients. Frost rolls while they are warm. Recipe mildly adapted from Allrecipes.com. I halved the recipe and this yielded 12 medium rolls. 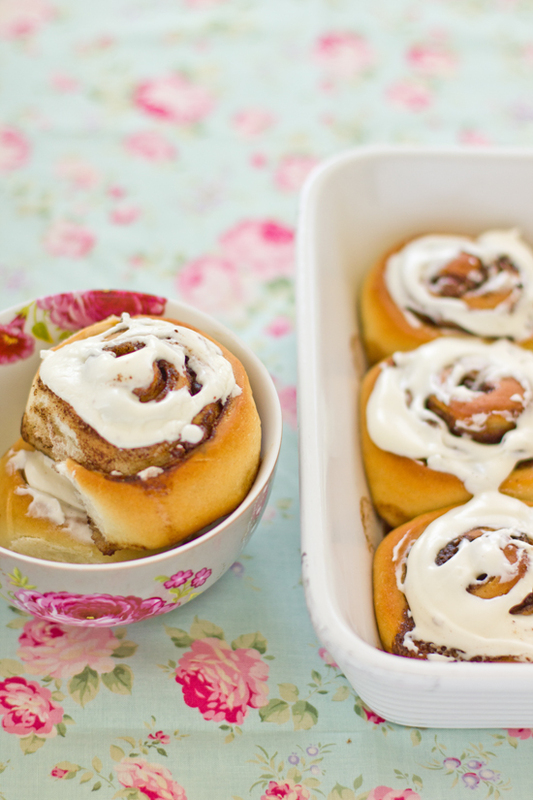 Lovely cinnamon rolls! They look irresistible. I love those cinnamon rolls we get from Cinnabon--one of my favorite haunts in town. Yours look even better plus it's homemade-yay! Glad you had a good time with your parents. Can't wait to see all the new recipes you've developed & of course more news of the giveaway... ;) Lotsa love from Doha. delicious, I miss cinnamon rolls! Wow, These rolls look so yumm. Congrats to the new member of your family. Congrats to your sister, fabulous looking cinnamon rolls..
How much more beautiful can they get? I go weak in my knees at the sound of cinnamon rolls and you have no idea what these are doing to me! So beautiful that the pattern in the bowl matches that in the fabric. Congrats on the little one!!! what fun to have a new baby in the house. and u are one lucky girl to have your sis. living by you! I love the props!!! I like the way you have a keen eye for colour and they all look so amazing- put together! Well done! 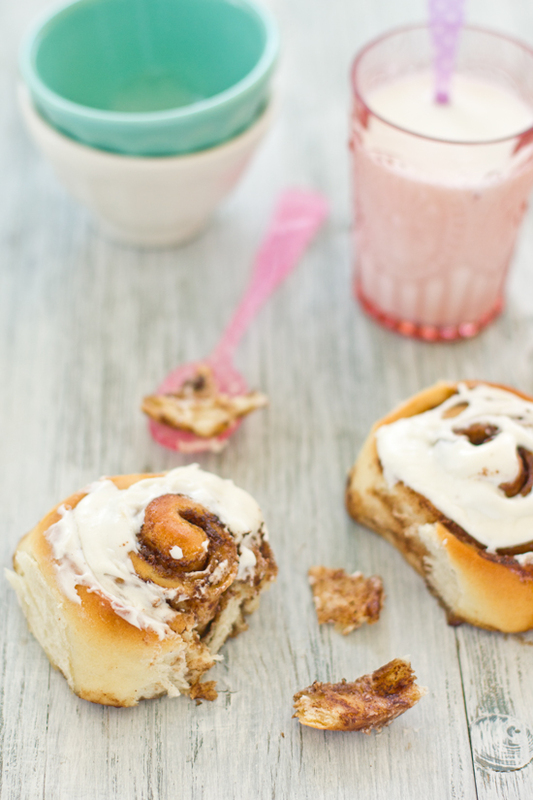 I have'nt tried baking a cinnamon roll yet, But i must, second recipe I read since yesterday and I'm drooling! Congrats to u and ur family..such a blessing children are! It's that cream cheese icing that does it for me - incredibly moreish. Congrats on the new addition in the family :) I miss spending time with my sister .. it's so nice that you stay in the same building and can be there for each other all the time! These buns looks just so perfect and so neatly shaped and the gorgeous pretty colorful props u used are looking so beautiful. Mmmm, looks delicious! i think I will bake these very soon. 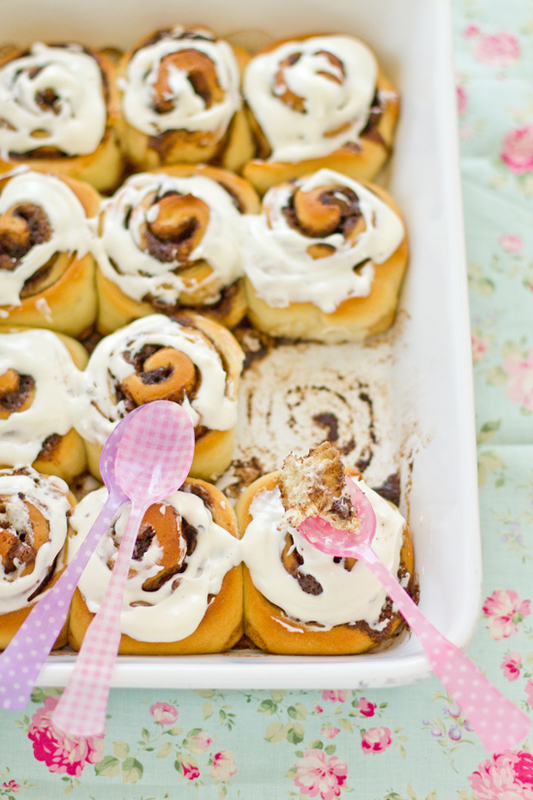 Yum - cinnamon rolls!!! They look fabulous! And congratulations on the new addition to your family. Happy times! Mmmm.......and you put chocolate in them too! I need to move next door to you, seriously. Congratulations on your baby niece Sukaina...i m forever stopping at Cinnabon for the rolls so about time i gave your lovely recipe a try...! 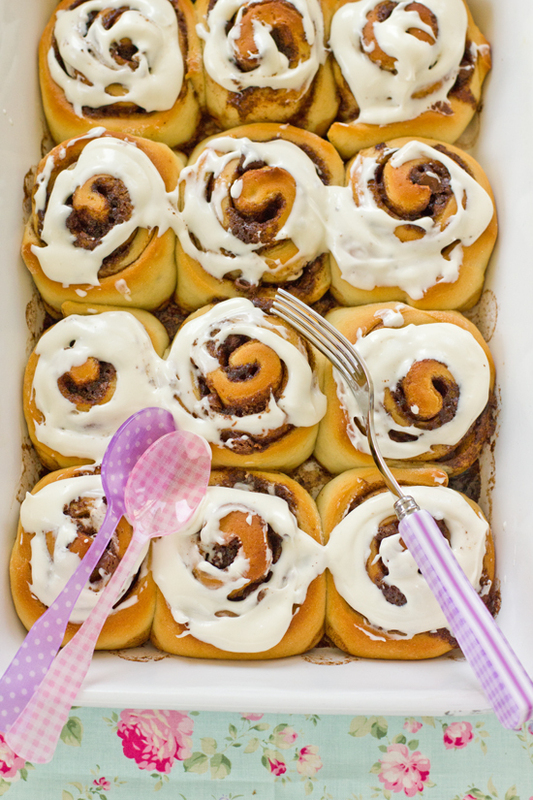 those cinnamon rolls look gorgeous! I have been thinking of cinnamon rolls! Yours look so beautiful! mashallah sukaina, your photography is amazing and so are your props. Seriously wanna make this now but photos wont be as great as yours of course. Do stop by if you've got a chance. baked this 2 days ago, i must say we loved the taste, but i left it slightly longer in the oven so the rolls was a tad bit crispy on the side! but i guess i shall make it to improve better. love love your blog! keep posting! I just take my mixing bowl and give it a little scrub. Then I swirl about a tablespoon of oil before dropping the kneaded dough in to rise. Makes getting the dough out so much easier! Also, I have less sticky dried-on dough to pull out of the bowl and probably waste. saying i love you after simply a couple of dates. conducted by regular lenders making installment loans. of proclaiming to offer you car loans. Hi sukaina, another great recipe. Made these over the weekend, they were yum but bit dense ( Cinnabon ones are lighter in weight) and will use less yeast next time (i ised active dry yeast and dissolved it in water). I also had to use extra flour as the dough was sticky.Any tips on how to make them lighter? Make sure to shut or near the containers effectively to avoid the destruction to the material. Japan has maintained a long standing tradition of getting everything backward, even the Goldilocks story. One morning in November, an 800 pound Ussuri brown bear wandered up to the Ikeda family homestead in the Sino village of Sankebetsu Rokusen sawa. The bear fled after only a few minutes, but returned several days later to a nearby house and mauled a baby before dragging its babysitter off into the woods to be eaten. Move over, former saddest thing ever, there's a new chief in town. He will live on forever through his music and his art and hopefully his goodness of heart will also continue to shine through and inspire people to be as generous as he was for his fellows and all the people he came close too through his life not only as an artist but as a human beeing as well. "We recognize the urgent need to better support people experiencing homelessness in Kelowna. The 52 supportive modular homes at 2025 Agassiz Road are a part of the Province's Rapid Response to Homelessness program and are much needed. The homes will benefit both people experiencing homelessness and the entire community by giving residents access to safe, secure housing, and 24/7 support services that will Cheap Cosplay Wigs provide them with the opportunity to rebuild their lives. Housing has successfully housed thousands of people in supportive housing units across the province and we recognize the impact homelessness is having on communities of all sizes. Housing, Interior Health and the John Howard Society of the Central and South Black Cosplay Wig Okanagan (JHSCSO) are all committed to ensuring the safety of residents, and neighbors in the surrounding community. Experience has shown us that we can create a positive environment Lace Front Wigs Cosplay in the building and successful integration with the local community through ensuring there is a healthy resident mix, and through 24/7 support. Housing, JHSCSO and several other community agencies will coordinate the resident selection process to ensure an appropriate mix of residents and to determine that the right support services are in place to ensure tenants remain housed and are able take the steps they need to transition to permanent housing.